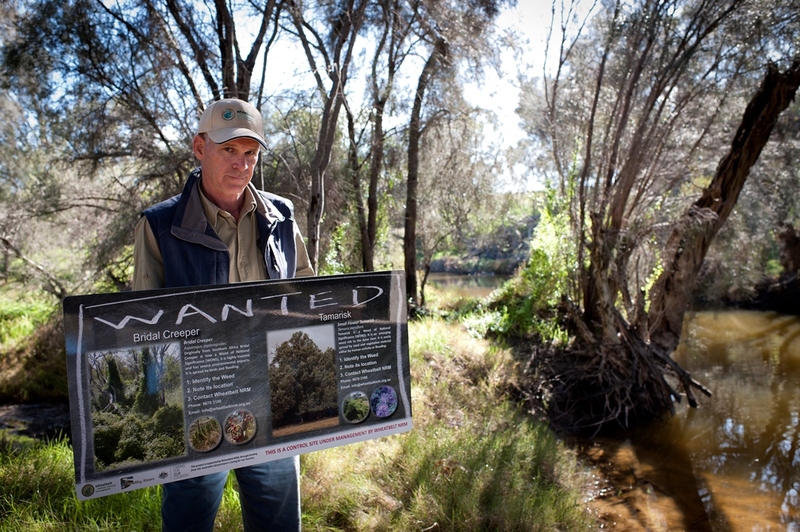 A campaign to eradicate weeds that are severely impacting on the biodiversity of the Avon River has stepped up a notch. Natural resource management group Wheatbelt NRM has spent the past year surveying for Tamarisk and Bridal creeper along a 150-kilometre stretch of the Avon River. Work will now concentrate on controlling these introduced species, both listed as Weeds of National Significance (WONS). Funding to the tune of $275,000 had been allocated to the project through the Australian government’s Caring for our Country program. Wheatbelt NRM project officer Greg Warburton said detailed maps of the area had been created using satellite imagery. “We spent months walking hundreds of kilometres of the Avon River from Beverley through to West Toodyay, using GPS to plot the extent of the infestations,” Greg Warburton said. “There are pockets of Tamarisk and Bridal creeper so thick, that the native vegetation is being choked out. “Now we know where the priority infestations are, we can start to use chemical, mechanical and biological means to control them.” Tamarisk originates from the Middle East and was introduced to Australia as a garden plant and a salt tolerant revegetation species. It was often found upstream of bridges where it was planted to protect pylons from flooding. Bridal creeper was introduced from southern Africa as an ornamental plant. “Controlling these weeds requires a lot of physical work, with back pack spraying of the Bridal creeper and chain sawing to remove Tamarisk,” Greg Warburton said. “Tamarisk and Bridal creeper are highly invasive, especially along waterways where they spread easily by flooding and Tamarisk can tolerate salty conditions. “Realistically, these weeds won’t ever be totally eradicated, but if something is not done, they will continue to take over the river system. “The frightening fact about Bridal creeper is it has 90 per cent of its biomass underground with a massive tuber system, which helps it to survive droughts.” Most of the control work for Bridal creeper will take place in winter and spring, while the focus will be on Tamarisk during the summer months. A team employed by Wheatbelt NRM including Northam’s Judd Davis, Toodyay’s Greg Warburton and York’s Alishia Ashworth and Rachael Major, were tackling the massive job. Signage was also being placed along the Avon River in Tamarisk and Bridal creeper hotspots, asking the public to report any further infestations.